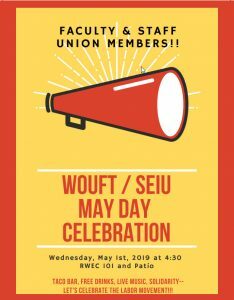 WOUFT is Local 2278 of the American Federation of Teachers (AFT). WOUFT represents all Western Oregon University faculty members employed at or above 0.5 FTE with respect to salary, employment terms, and work conditions. Since 1974, the federation has worked to promote the collective welfare of the faculty community. WOUFT works with its affiliated organizations to eliminate discrimination in institutions of higher education, to enact just laws which will improve the climate for students and faculty, and to advance the public image of higher education. Affiliate organizations are AFT, AFL-CIO, and AFT-Oregon.